Some weeks I look back on what I accomplished and I am surprised that I did so much. This is one of those weeks. Kids being back in school and a mostly unscheduled long weekend led to a lot of sewing progress for me. Last Thursday the first sewing instructions came out for the Meadow Mystery quilt, by Cheryl at Meadow Mist Designs. 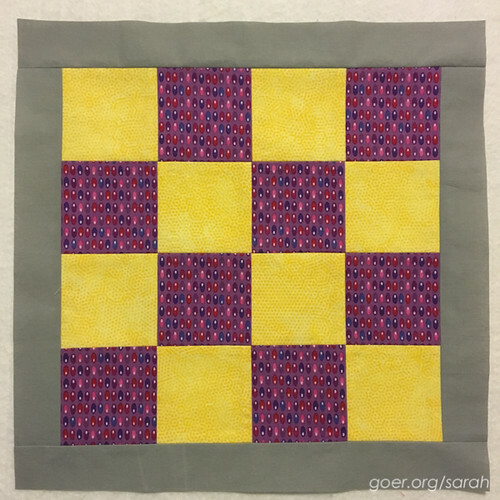 I managed to finish up my cutting that day, but I haven't yet started the piecing. I have all month to get it done and still be on track, so I've been working on some other projects first. 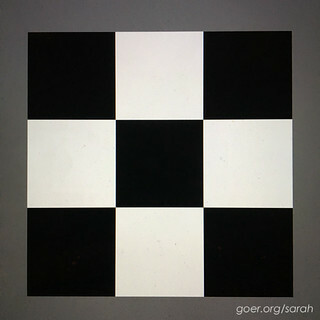 Instagram and Facebook are filled with beautiful versions of the first blocks. Yesterday, on the sixth day of the month, I shipped all my bee blocks for the month! This is unheard of. I sent two for my Do. Good Stitches group and one for Shirley in my Bee Hive swarm. 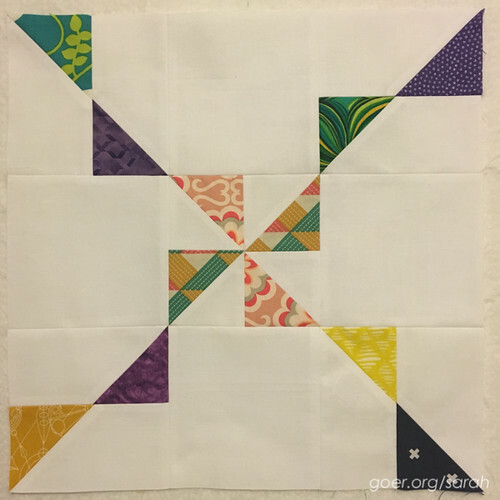 Plus the two bonus blocks that I showed you on Monday for my friend Mary. It's so nice to have the monthly commitment already checked off. Sometimes I get them sewn early in the month, but then I usually don't manage to get them out the door until the end of the month. I get up at 5:30am now. I'm just over a week into this new routine. It means I go to bed at 9:30pm sharp these days, but the kids don't get up until 7:00am so I get a fair amount of time to myself in the mornings. I am not inherently a morning person, but I think this is working. Over the weekend I kept up my schedule, since I figure that's easier than sleeping in on some days. This meant even more time to myself since nobody else in the house had anything to get up early for. I've used this time in a variety of ways, but I spent one of those weekend mornings making progress on my La Passacaglia project. I was halfway through connecting the pentagons, and I finished that step and attached them to the center section. 20 pieces down, 70 to go in this first rosette. Now I need to prep a bunch of itty bitty triangles to make the ten stars that go around this section. Secret sewing is exciting, but it's so hard not to share. Luckily, I have a few friends who I can text pictures to when I'm itching to share but can't post publicly yet. The first project is a quilt that I've finished the top for. I'll be able to show it off once I've given the gift. The second secret project is my Nine-Patch Challenge quilt for Quilt Con that I've finished drafting in Illustrator (with Daisy's help). I've actually designed two versions. I think I'll piece the easier one first and then I'll decide if I want to try to tackle the harder one. 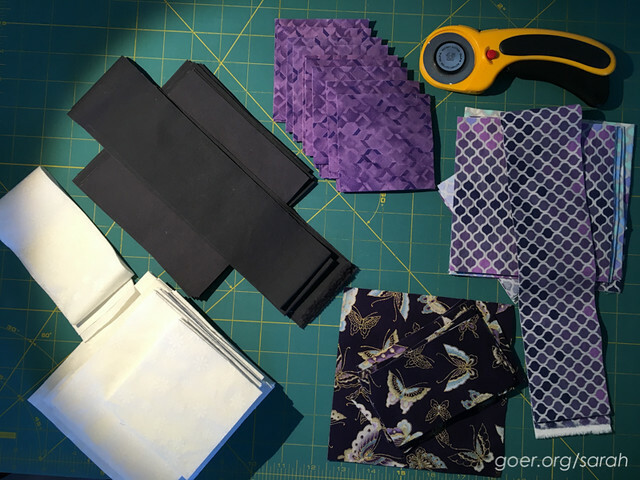 My next steps on this project include deciding what colors I want to use and how to go about piecing the trickier parts. I love color and I find inspirations in a variety of places. 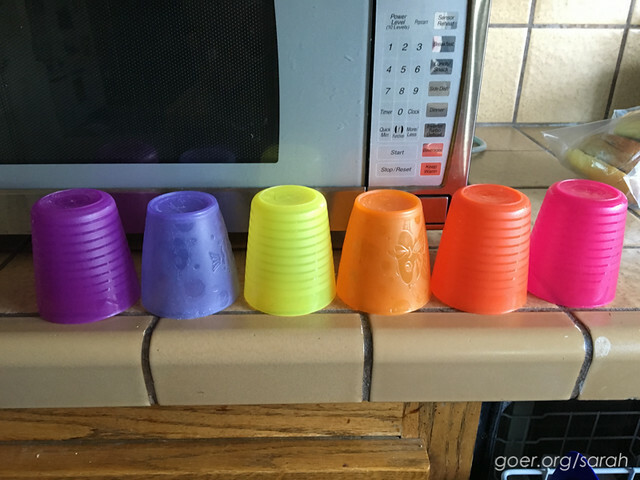 This week presented two color palettes that stood out to me. 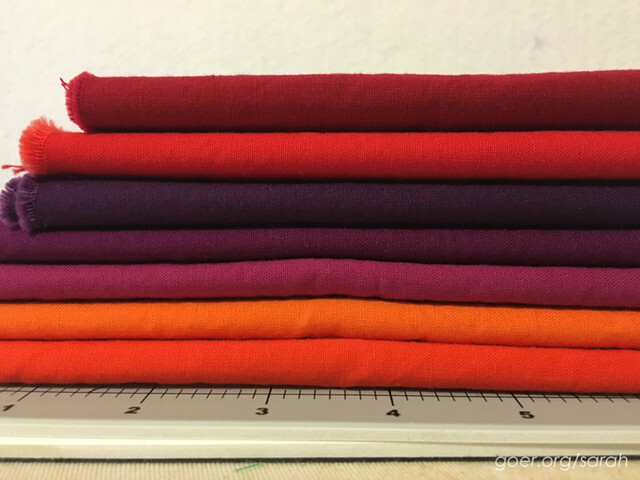 First, as I'm working on chipping away at pre-washing and putting away my summer fabric acquisitions I stumbled across this palette of solids that reminds me of a vibrant sunset. I have some improv piecing in mind for these lovelies. These palettes are both particularly interesting to me, because I generally gravitate to the cool colors. I'll have to finish a bunch of other projects before I can dive into these, but I'm keeping them in mind for when I "need" a new project. Thank you for visiting! I'm linking up to Midweek Makers, Let's Bee Social and Needle and Thread Thursday. 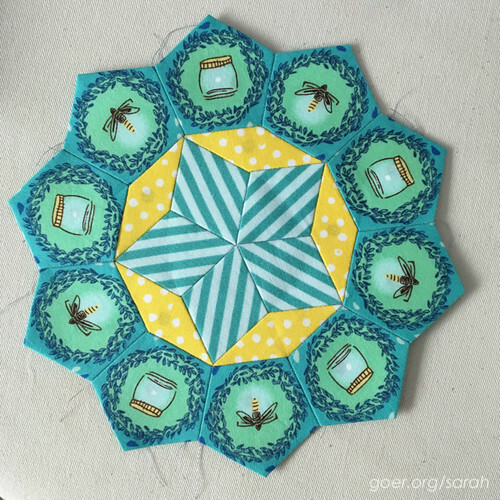 WIP Wednesday: February Challenges WIP Wednesday: Kids, Stars and Bees October Quilting Progress WIP Wednesday: What’s in the Cards? Posted in Quilting. 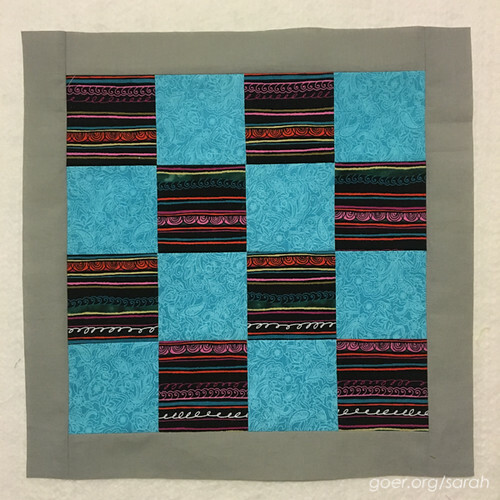 Tags: 9-patch Challenge, bee blocks, color inspiration, La Passacaglia, Meadow Mystery Quilt, mystery quilt, quilting with kids, sewing with kids, WIP Wednesday on September 7, 2016 by sarah. wow, busy bee....I really, really like your La Passacaglia project!! Looking very forward to seeing the completion of it.. The completed bee blocks you sent off look really nice...And, I really, really like the color combination of your cups lined up on your 80's tile. :-) Good luck with that inspiration!! Thank you, Bo. I've been admiring the La Passacaglia quilts for quite some time. It'll take me forever to complete, but I love it! The 5:30 wake up seems like a secret, I agree. I'm surprised that it's working for me, but it is. Thanks for visiting, Yvonne. You have been productive so far this September. But I can't imagine getting up at 5:30 a.m. It's still dark then. Thanks, Anja! Yeah it's dark then, but to be fair I usually lay in bed and read email and IG until 6 and it's light(ish) by then. I don't have the luxury to lay around when I sleep until 7. Then it's time to immediately start hustling the kids. The hour or so out of bed before they wake up is nice. Wow, a little organization and those early mornings have paid off. You have accomplished a month's worth of projects already! 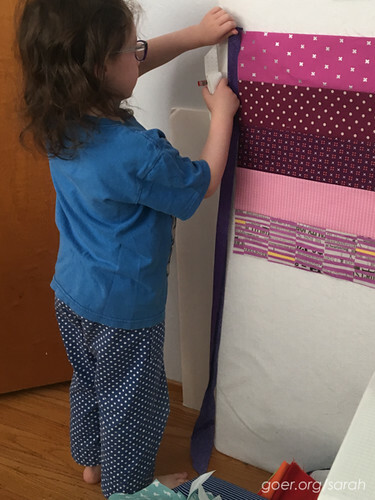 Love your daughter's quilt project. So sweet. Bee blocks done in the first week. Way to go. Your beautiful bee blocks are on their way already? That must be a good feeling! I'm an early riser too and really enjoy having that time (and coffee) to myself before the busyness starts. 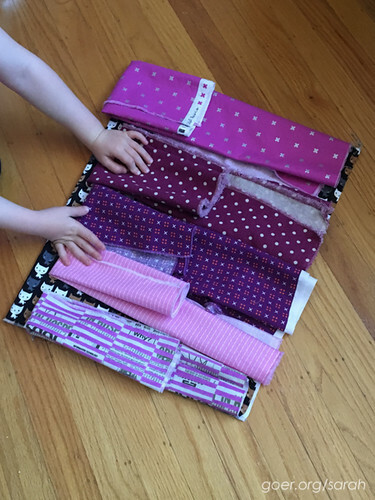 You and your daughter have shared some really fine patchwork in this post! And your inspirational pics are looking promising.... I tend to gravitate toward the cooler colours too. It feels great! Being an easy riser has been a bit harder on days that my sleep has been interrupted. Last night it was a cat fight in my backyard (not my cats) and then a car alarm. I'm not feeling quite so peppy today. ;-) I'm excited about my daughter's quilt. It might have something to do with purple being my favorite color. :-) Thanks for visiting, Lorna. Thank you, Louisa. I'm really a night owl... as long as I've forced myself to go to bed EARLY getting up at 5:30 hasn't been bad. Surprisingly easy, even. Thank you for visiting. I really like those fussy cut bugs that you're slow stitching with. Fun! Good luck with your rainbow experimental palette, it's one of my favorites! ;) Your Meadow Mystery colors are really pretty too. Thanks, Rachel. I think the fussy cutting is my favorite part of the La Passacaglia project. I don't know what fabric I'm using on the next rosette or what I'm doing to make sure the whole quilt is cohesive in some way. I only chose the fabrics for this first part. I'm excited about my Meadow Mystery quilt. I look forward to getting some piecing done to really see the fabrics together! I don't know how you do it. I can't manage to get up early. You get up early and get so much accomplished. wow. Everything is so pretty - can't wait to see more! Thanks for sharing on Midweek Makers!